Ideal for indoor or short term outdoor usage. Lowest Price available in the UK! For your most economical vinyl banner look no further. These banners are a great affordable option to publicise your event, party, celebration or fete. With a cheap professional vinyl banner, its sure to get noticed and attended! 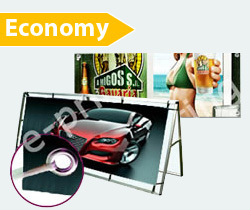 Economy Vinyl Banners Price List. Our Economy Vinyl Banner is slightly thinner in gsm value (350gsm) than our Standard Vinyl Banners(500gsm), but this banner can be the cheaper option to match your requirements. We at E-printing always believe in giving you the best value for your money so with our Economy Vinyl Banner you wont be disappointed!